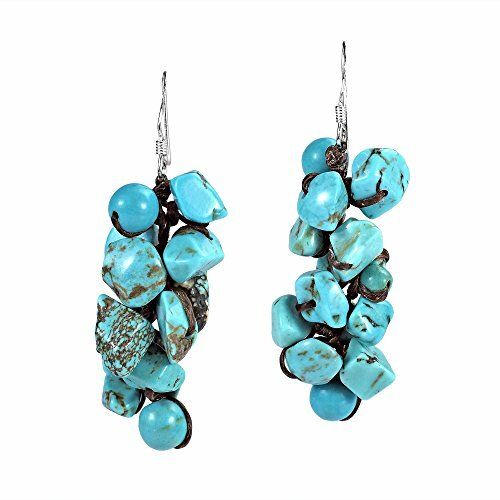 Clusters of simulated turquoise on a cotton rope strand hanging from sterling silver hooks embellish these unique earrings. Add an exotic flair to your style with these earrings that were handmade by artisan Thidarat from Thailand. PLEASE NOTE: The handcrafted nature of this product will produce minor differences in design, sizing and weight. Variations will occur from piece to piece, measurements may vary slightly. ARTISAN STORY: My name is Thidarat I am a full time Thai government employee working in Bangkok. I love to design and craft the jewelry by myself. I am happy when I see others appreciate my designs. This inspires me to make more beautiful jewelry. My designs are made by friends and family in Lamphun, the northern province of Thailand. My satisfaction comes from being able to create work and income for the people back home so that they can have a better life.